The coach of the men national team, one of the top grandmasters Alexander Motylev explained in his interview to Yana Melnikova (for the official site of Moscow Open) the reasons why he decided to participate in Moscow Open. - Alexander, how many times did you participate in Moscow Open? How successful were you? - I played at Moscow Open only once 2 years ago. I was quite successful: I got +4 but as there were many participants, I managed to get only in the 2nd tens of the rankings. - When did you make up your mind to participate in this tournament? - 2 months prior to the tournament. I used to coach rather than play for the last time so I miss the game. That’s why at the beginning of the year I decided to play at 3 tournaments at once: Moscow Open, Aeroflot Open and Europe Championship. - How important is this tournament for you? - Firstly I want to show good results of course. This tournament can be also considered as a preparation for the future official tournaments, particularly to the Europe Championship. - Did you manage to find some time for a serious preparation? Don’t you feel exhausted after the last World Championship? - I feel exhausted a bit although in Turkey I was coaching rather than playing. There was no time for a serious preparation. - The traditional festival is being held in Wijk-an-Zee in the Netherlands now in which you participated last year. Do you root for someone? - I coach Sergey Karjakin now so I root for him very much. That is a very interesting tournament with a woven plot. I think the winner would be determined in the last round. I wonder who he would be. - How many times did you participate in Moscow Open? And how successful was it? - I played last year. It was neither good nor bad. And two years ago I came to visit Anna Burtasova, and was helping her. - What do you like about Russian tournaments? What don’t you like? - I like the atmosphere: good company, many friends. Russian mentality is closer to me than the German one. But I don’t like food. - Do you enjoy playing in a separate women’s tournament, or, would you prefer everybody to play together, and the prizes for women remain the same? - In general, I don’t mind either way. But it is much easier to win good prizes in a separate women’s tournament. When we play together with men, a drawing of lots in the last round is crucial. For example, at the Gibraltar competition a drawing of lots was conducted manually. The situation was that on the last day I got an opponent with the Elo-rating of 2500, and my competitor’s opponent was rated 2100. She won, and got a good prize, and I drew, and was left with nothing. - What is, in your opinion, a distinctive characteristic of Moscow Open? Something that is different from other tournaments? -A distinctive feature is that there are many different groups. And I don’t know if there are any other Open tournaments for women. I really like the fact that women chess is developing in Russia. Unfortunately, it is not the case in Germany. - How are you feeling in Moscow in winter? The forecast for February is -20. Aren’t you afraid? - What is your attitude towards women “Oscar”? 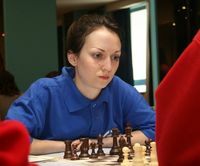 Are you going to put your name down for the best female chess player 2009? For whom would you vote? - I would not put any name down for it. “Oscar” is a characteristic of Hollywood. And people there are already messed up in the head:) Chess “Oscar” has already got a bad reputation. People have probably thought that we are even crazier than in reality. As for me, I did not play very well in 2009. Nadya Kosintseva was the one to progress most. I would have chosen her. - How is your service in the German army? Upon completion, would you consider entering Russian State Social University, like Sergey Karjakin, for example? - I completed my military service in April 2009. Now I am studying for a degree in “international journalism” in Berlin. It would be interesting to enter a Russian university afterwards. I am more Russian than German. So I can live in Russia. But I am still very punctual:). - Which time control do you prefer – classic or blitz? Will you try to qualify for the Blitz women’s world championship scheduled for September 2010? - I have not heard about the blitz world championship. It’s interesting. I’ll probably play there. But I prefer rapid chess, for example, with time control of 20 min + 10 sec. I am not so young for blitz chess any more:). 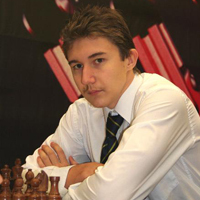 Sergey Karjakin is officially listed as a Russian player in the January FIDE rating list. He gives an extensive interview for segodnya.ua, where he talks about his absence from the World Team Championship, his expectations as a Russian player, the Candidate matches in Baku. At the January FIDE rating list you are already listed as Russian. How did you feel when you receied the new chess citizenship? It was a formality. Because I already have the citizenship of Russia, and lately I live in Moscow. So that nothing unexpected happened. But this formality gives the right to play for Russia? I would have played for Russia at the World Team Championship, but for some rules, I do not know by what, I still do not have the right to play for the Russians. 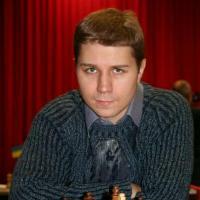 I hope, I will play for the national team at the end of the year at the World Chess Olympiad 2010 in Khanty-Mansiysk. How did guys from the Ukrainian team react to your move? With a full understanding, because the situation in Ukraine is absolutely deplorable. Just an example, on 1st of January FIDE excluded for non-payment Ukraine from the World Federation rating list. Where are you staying in Moscow? I rent a two rooms appartment in Moscow. A friend helped me, so it is not very expensive. I hope one day to have my own appartment in Moscow. Hard to get used to the rhythm of the metropolis after Simferopol? It is hard, but I was always wanted to live in a big city. My wife is from Kiev, so she is used. But Moscow looks vast, even after Kiev. There are some duties to the Federation of Russia? There are no specific terms. Nobody can promise to be a world champion or win several supertournament in a row. But, on the other hand, they invested in me, and I have to justify the trust. What do you think the fact that Kasparov takes care of the Norwegian Magnus Carlsen?Indeed, many believe that soon it Karjakin and Carlsen will play among themselves for the title of world champion? I am sure, Magnus greatly benefits from the cooperation with Garry Kasparov. But I think more about yourself. I train with Kasparov’s coach Dokhonian and learned from him quite a lot. And about our rivalry with Magnus, it is journalistic invention. I do not think of Magnus as my principal rival. Do you have a chance to get into Candidate matches tournament for the world championship 2011? Maybe, after moving to Russia, Ilyumzhinov will write to you as the main hope of Russian chess and will invite you? I doubt very much I will participate in the Candidate matches tournament, the candidates are many. But if Ilyumzhinov gies a ticket, I will not refuse, and I will be very grateful to him. Meanwhile in front of me there is a goal to enter the top-10 world ranking.